Halloween is nearly here and our inboxes are being haunted by some scary-good emails. Take a look at these ghoulishly clever examples for inspiration, if you dare. Taco Bell gets their customers excited about Halloween and their brand with a Taco Bell-inspired costume contest. 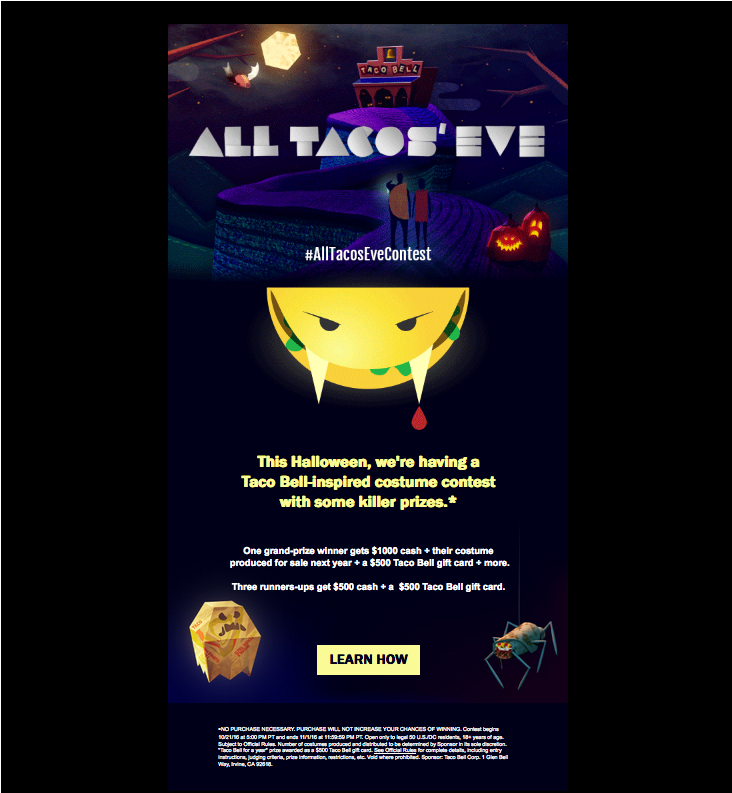 Their promotional email is cleverly decked out with graphics that blend traditional creepy crawlies and ghouls with the fast-food chain’s menu items. The taco vampire, burrito spider and taco wrapper ghost not only serve as great costume inspiration, but they’re also attention-grabbing and fit perfectly with the Mexican chain’s offbeat humor. Orange and black are always a winning color combination for Halloween emails. But those who prefer to stay true to their brand when designing their All Hallow’s Eve-themed messages should take a look at this example from Domino’s. 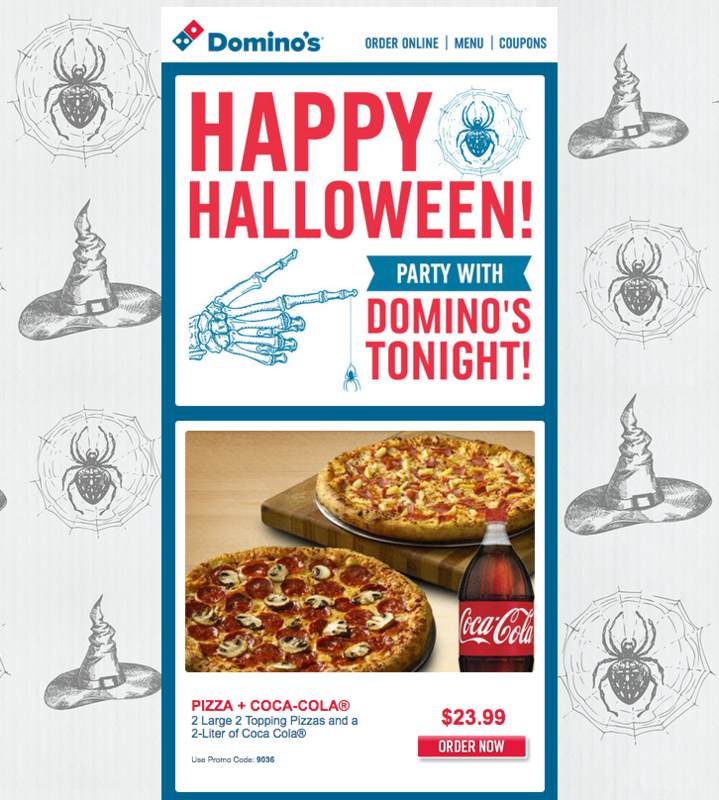 The pizza chain sticks to the red and blue color scheme they’re known for, but seasonalizes its typical email design with spooky illustrations. Subject line: Halloween treats have arrived! 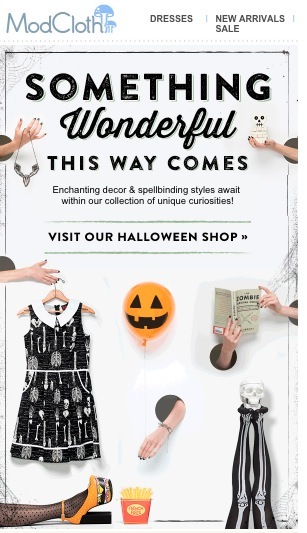 ModCloth tempts their subscribers with new products in their Halloween shop, and their email imagery backs it up. Notice this email does not contain an offer. Subject line: No tricks. Just treats. Up to 50% off! 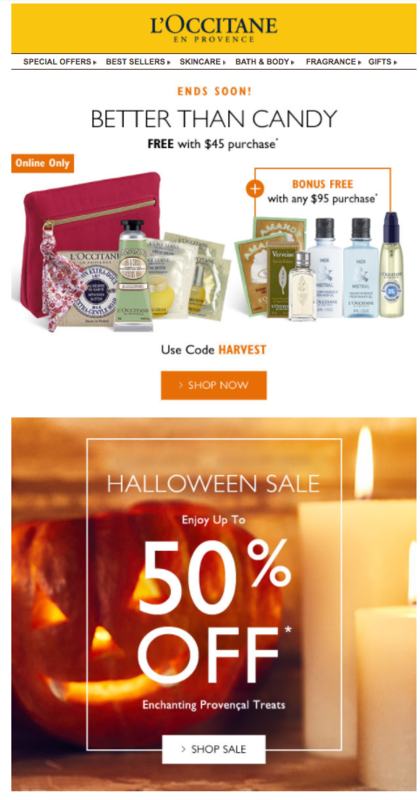 L’Occitane en Provence offers their customers a treat that’s “better than candy”: a Halloween sale and free-with-purchase gifts. 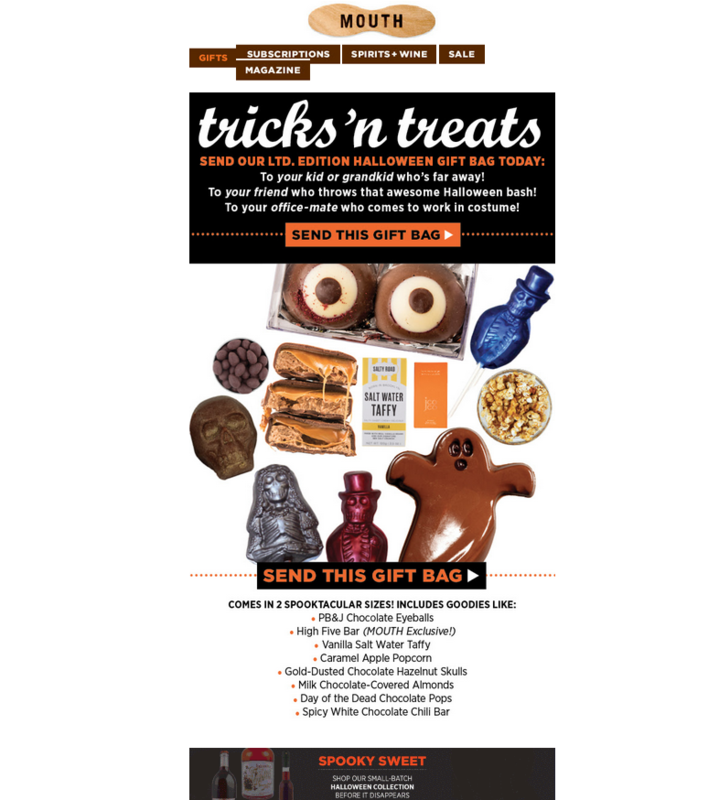 Their holiday-themed subject line is carried through to the copy, the pumpkin imagery and even the seasonal promo code. The use of “Howl-o-ween” in this Defenders of Wildlife subject line isn’t just a nice example of Halloween wordplay; it also cleverly underscores the conservation organization’s cause. Their message to supporters similarly connects their mission to the holiday, referencing the owl’s spooky reputation — and the even scarier reality that its habitat is threatened. 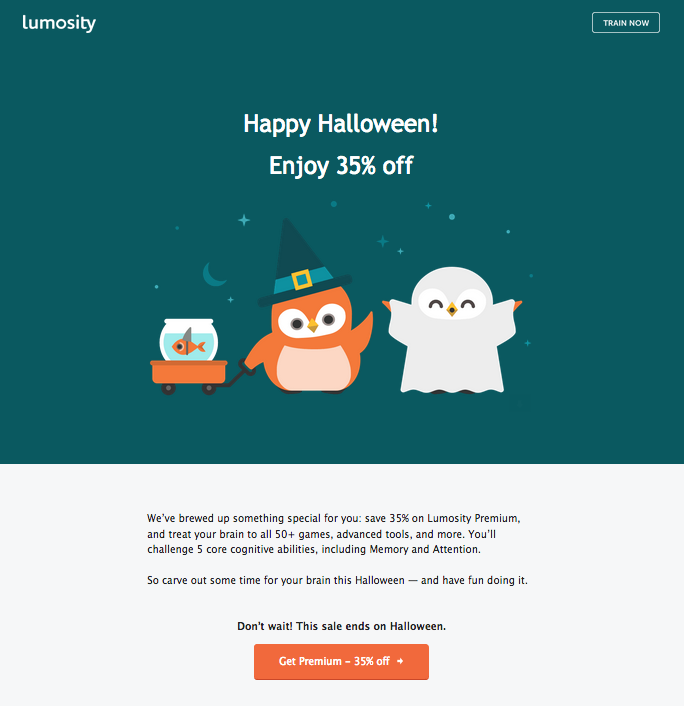 Now that you’ve seen some frighteningly good email examples, it’s time to send your own Halloween campaigns. Whether you’re promoting a monster sale or just delivering a festive greeting, remember to have fun as you design your message.